The global AI in manufacturing market is anticipated to traverse alongside a highly remunerative growth graph in the ensuing years, owing to the rapid adoption of automation across various production processes. The manufacturing industry has always welcomed new technologies in the process landscape, with the integration of technologies such as drones and industrial robots dating back to 1960s. The manufacturing sector is now gearing up to witness the next automation revolution through the adoption of AI technologies. Through the adoption of AI technologies, companies can keep inventories lean and minimize costs, which can help the manufacturing domain experience substantial growth in the coming years. This also goes on to validate that presently, the manufacturing sector will need to prepare itself for networked factories where the design team, production line, supply chain, and quality control will all be linked into an intelligent engine that facilitates actionable insights. Lately, several manufacturers are looking to revamp their facilities to adapt to today’s digital world. This adjustment which is termed as smart manufacturing, or the fourth industrial revolution encompasses the inclusion of numerous technologies including IoT and cloud-based platforms. An example to validate the point involves a recent partnership between Amazon Web Services and Volkswagen to create an industrial cloud for the carmaker’s 122 manufacturing plants across the globe. The technology will connect all the machines, systems and plants across the carmaker’s global facilities to optimize operations by helping avoid bottlenecks. The rising adoption of cloud platforms and IoT platforms will produce tons of digital data, which will require advanced AI-driven data analytics solutions to process data and extract valuable insights. Thus, the rapid adoption of IoT and cloud-based platforms will help proliferate AI in manufacturing market growth over the ensuing years. Although automation through robotics isn’t a completely new concept for the manufacturing sector, the combination of robotics and computer vision presents a totally different set of potential benefits to the manufacturing sector. 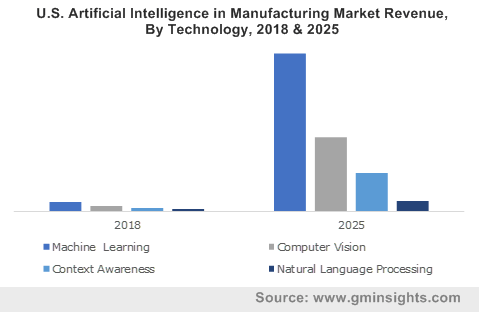 According to Global Market Insights, Inc., the AI in manufacturing market size from computer vision is estimated to grow at a CAGR of more than 45% over 2019-2025. The growth can be primarily accredited to the increasing need for automation in processes like quality inspection, predictive maintenance and defect reduction among manufacturers. Citing an example, the U.S.-based FANUC developed a software program called the ZDT that collects images via cameras attached to robots. The images augmented with metadata are then sent to the cloud and processed to identify issues before they occur. During a trial, the technology was deployed to 7,000 robots in around 40 production lines, which detected and prevented more than 70 failures. The growing need to prevent defects and improve productivity in manufacturing plants will thus drive the demand for computer vision technologies, thereby propelling the global AI in manufacturing market growth. Technological advancement is quite overtly, a significant contributor to the growth of this industry. Recently, Altizon, an industrial IoT platform company, showcased its innovative and proven manufacturing intelligence at a premier trade show for industry 4.0 innovations. Altizon’s Datonis Manufacturing Intelligence is a manufacturing solution that defines and delivers key performance indicators for computing productivity, enhancing quality, and to perform predictive maintenance. The successful adoption of such innovative solutions will further augment the global AI in manufacturing market growth. In terms of the regional spectrum, figures by Global Market Insights, Inc., state that the Europe AI in manufacturing market is set to grow at a CAGR exceeding 44% over 2019-2025. The exponential growth in advanced technologies like big data, robotics, IoT are the foremost factors driving the regional industry. AI technology is regarded as one of the significant drivers of industrial growth by several companies in Europe, mostly due to its benefits that result in flexibility, efficiency, and differentiation. Moreover, to boost consumer confidence in Europe AI, policymakers are in talks of imposing ethical guidelines as well. Some experts are even personally convinced that ethical AI guidelines will turn out to be an enabler of innovation for artificial intelligence and boost European investments in AI. These parameters in tandem with surging labor costs will stimulate the adoption of AI-driven manufacturing technologies in the region. Driven by the exponential growth in robotics, big data, and IoT device adoption in conjunction with the growing demand for automation among several major companies as well as SMBs, the global AI in manufacturing industry is all set to depict commendable growth prospects in the years ahead. According to Global Market Insights, Inc., the overall AI in manufacturing market is anticipated to surpass a valuation of $16 billion by the end of 2025.